Want to open an attractive, secure webstore? Already running osCommerce and need an integrated accounting software package? Or perhaps you need an entire eCom solution with no long-term costs? 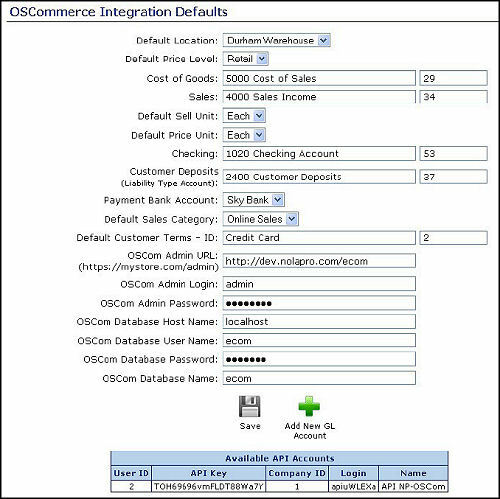 Offering a virtually seamless integration with the popular osCommerce package! This tie-in allows you to share customer, order, payment and inventory information between the systems and lets you monitor inventory levels using the advanced Inventory module. With one click you can connect any item to a product in your webstore. Orders are passed from osCommerce into your program in real time, so you can say goodbye to double-entry of your online sales information. How is data linked with osCommerce? Orders, customers, inventory items and sales taxes can be linked from OSCom. Orders and customers will automatically have a linking OSCom ID assigned. If you edit a fulfillment order you will see a box called OSCom Order ID. This contains the equivalent order ID from your online store. Likewise when you edit a customer you will see a box called OSCom Customer ID and this is the record ID from OSCom for this customer. You should never need to adjust these numbers. To tie inventory items to those in OSCom you will need to put the product ID from OSCom into the box labeled OSCom Item ID. After doing this, incoming orders from OSCom will commit inventory inside your program and shipments will reduce your quantity in stock. This essentially allows you to manage accounting for your OSCom inventory. When you receive items into your inventory from POs the quantity available in OSCom for that related item will be automatically updated to match the new level. If you need to charge sales tax for purchases made from within your state, that's no problem either. This tie-in can also link the OSCom tax with a sales tax. Note: osCommerce hosting done on our servers will be at a monthly fee of $20. This product was added to our catalog on Tuesday 09 June, 2009.